The level of anxiety is becoming higher in the world today. It was traditionally high in Russia. It looks as if 20th century Russia lived under the motto “may you live in interesting times”. The country has gone through several wars, bold social experiments, dramatic changes and crises. How did all this influence the lives of average Russian citizen and Russian culture overall? It became habitual to anticipate that unexpected disaster might happen. That families might lose all their savings. That social status might change from high to low and vice versa in several months. That results of planning and strategic thinking might turn into a joke. That it is important to value the current moment, to live here and now. It also brought a kind of tolerance of stress. Strength to overcome difficulties, durability and fortitude. Inventiveness and resourcefulness. Low trust in relation to state and government, the habit of relying on oneself. After a relatively calm period between 2000 and 2013, negative events started again in 2014: the annexation of Crimea and economic sanctions from the West that followed; the collapse of the rouble in late 2014 (real incomes halved); the decrease in oil prices (the Russian economy being built on oil); two wars (Ukraine and Syria) – these have all had an impact on social mood and contributed to increasing anxiety. On Сhart 1 we can see represented the dynamics of social mood from 2010 to 2017. 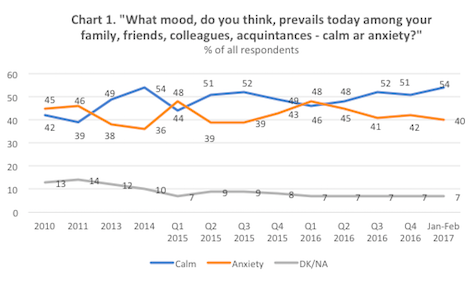 The level of anxiety is very high during all periods: it ranges from 36% to 49% of respondents, with the lowest average degree in 2013 and 2014 (after a calm decade), reaching the highest levels in the 1st quarter of 2015 (after the events of 2014) and the 1st quarter of 2016. In 2017 the crisis is still here, however, the social mood has become calmer. Citizens have adapted to the situation. Still 40% of people believe that in their environment anxiety prevails over tranquility. • Risky consumption is popular. Adventures, speed of life, self-indulgence – everything that helps take the most from the current moment. • External signs of status and strength are very important in the dominant culture – rich and powerful are less vulnerable. • Controlled consumption, attention to brands, reading packs before purchase. The belief that it is impossible to control external factors, but possible to control what one eats and buys. In this article, we will analyze how the last two tendencies are represented in marketing communication and branding. We will show how brands in Russia help consumers in building personal strategies of safety. We will also provide some examples from the cultural and media fields. One way is through a literal interpretation of the theme in the form of protecting borders, or products that provide strength and may help even in a physical sense (numbered below 1.1.-1.3.). Another type of code utilizes topics that are not directly related to protection, but can decrease consumer anxiety in a subtler way: associations with kind nature, trusted traditions, or wise technology (see codes 2.1-2.3). Such codes describe sources of protection that exist in the outside world. The third type of interpretation goes deeper to the understanding of safety and what it means to consumers. Such codes refer to signs of comfort, care, support of the community and control over personal choices (3.1-3.3). This group of codes speaks about human input in creating the sense of security: relationships and personal responsibility. Some of the brand examples we provide for the second and the third group of codes probably were not aimed by their designers to communicate protection (or only protection). But they do so on the connotative level. They also show possible indirect ways of presenting safety, that may be used by other marketers. On the Chart 2. we have summarized the main semiotic codes of protection observed in communication materials representing brands in Russia in the recent years. This chart describes the dominant semiotic field, the signs that are common and universally understood in Russian culture. Although the codes were derived from Russian material, we believe that some of them could be successfully integrated in marketing communication in other cultures or in global campaigns. Below is a description of the main codes. This is one of the most popular codes in communication of safety and protection. “The barrier” speaks more about prevention of a problem, rather than relief. By using the code a brand becomes associated with a reliable partner. The border prevents a problem from intervening in the consumer’s life, be it insects, infection, dirt, or computer viruses. Very important here is the dichotomy “me-others”, or “a person – an outer world”, “friends – enemies”. Symbols of barriers are often combined with the signifiers of efficacy and power: red, bright intense colors, images of heroes, strong animals. That is a kind of militant protection and it is usually used in communication of products which serve “against” something: medical remedies, insecticides, cleaning products, information security and such. Sometimes the product itself is portrayed as a barrier: for example, an SUV car or an IKEA home which hides its owners from the disasters of the world outside. The code is almost never used in communication of “peaceful” products, which do not fight with the problem, but protect the consumer from it in other ways (vitamins, ecological food, gadgets). Signs: shield, protecting circle, wall, shell, black color, thick and hard substances, etc. Also, metaphors of safety belt, lifebuoy. This code is close in meaning to the previous one. It also speaks about fighting the problem. The “me-others” dichotomy is strong in this code too. Here, however, consumers are portrayed in a more independent and powerful position. They do not hide behind a shield; they take an active role in dealing with the situation. The product in the hands of a user adds strength, power and reliability. This is a predominantly masculine theme. Even in communication of unisex products, when a human character appears in the context of the code it is usually a man. This theme is frequently used by companieswho associate their products or services with provision of safety: insurance, banking, pharma, food (security from hunger and lack of energy), household cleaning, personal hygiene. Signs: firm and solid shapes, convenient to hold in the hand; a fist; dark colors, non-transparent surfaces; seriousness. Personification of a protecting figure. This appears in the three different forms: “Real man”, “Magic Helper” and “Strong Animal”. “Real Man” – physically strong, big, usually serious. Patriarchal dream. He can be presented as a portrait of the consumer, or a man who protects the consumer. In the latter case, consumers are usually women, children, and more rarely other men (not as strong as the Hero). “Magic Helper” – popular characters of superheroes (Spider Man, Super Man, Russian bogatyrs (knights)); animated characters, usually masculine; the product itself as a magic helper. The difference from “The Tool” is that in this code, the product acts itself. It is not a tool in a hand of a user, it is an independent character. “Strong Animal” – lions, tigers, bears, horses and others. Brands are associated with the power, energy and aggression of these animals. The consumer is usually described as a handler. Sometimes animal energy is attributed to the consumer. Connotations of paganism. Signs: powerful actions and actions above human abilities (flying, breaking walls); loud sounds, roaring; big muscles. The consumer is behind the hero, under protection of it. When the product is shown alone: camera angle down-up, light on the “hero”, central position in a shot, big size. Nature is a powerful resource for lowering anxiety. Green fields, blue sky and still water are well-known signs of calm. Calmness in its initial, clear form. These signs are widely used in marketing communication, especially in the food category, cosmetics and hygiene. The code connotes that the product protects consumers from threats associated with modern technologies (including chemical poisoning). This code exists in the two main forms. The first is about the origin of a product: an ecologically clean region of Russia, a farm with eco-style production and so on. The second form speaks about one or more natural ingredients within a product. Both versions are mainly used in branding for female audiences. Within this code, women are portrayed as tender, fragile and beautiful in a classic way. Signs: green, beige, light-blues and other neutral clean colors; images of plants (flowers, herbs, berries, spices); little cute animals (sheeps, rabbits, birds); slow pace; static images. Text: “bio-…”, “eco-…”, “chemical-free”, “no additives / preservatives / GMO” and etc. Although “Science” is not necessarily about protection, the associations with it are often used to communicate safety (“Rexona men – maximum defense”). Science provides safety from failure. It guarantees quality. The choice is supported by data and expert opinion. Scientific protection is advanced, precise and proved. The code is mainly masculine, as it is based on the rational perception of the world (in the dominant cultural field in Russia rationalism is associated with masculinity – irrationalism and intuition with femininity). One of the interpretations of the code is futurism – faith in a better, smarter future and new ways to provide security. Signs: metal colors, smooth surfaces, formulas, figures and charts, micro-elements, scientists and experts, computers and robots, industrial images, futuristic factories and machines. Text: scientific terminology, abbreviations, names of chemical ingredients (Zn). Safety sometimes lies in things proved by experience over several generations, well-known and habitual. Childhood memories, fairy tales, common food and recipes. The popularity of symbols related to national traditions in culture and in branding has been growing in the recent years. The Russian Federation has a long history, although in its modern form, as a capitalist republic, the country is just about 30 years old. Russia is in search of its national identity. • Present time. Russian soul. Local products. Sometimes all these types are combined in the same communication campaign, showing the rich history of the country. Signs: historical elements, documentary style, stylizations, national symbols (such as birch). Protection may come from those who surround us. In the Russian collectivist culture, it is normal to expect support from family, friends and even from a stranger on the street (but citizens rarely expect help from the state and government). Signs: holding hands, parties or family gatherings, domestic atmosphere (calm light, relaxed poses), friendly smiles and actions of help, support. Text: “always here”, “friends recommend”, “one of us”. This code is about soft and caring protection, which in Russian culture usually comes from women. Women feature in the majority of ads in pharma, food and household products categories. They are presented as experienced consumers, who know the available options and make the best choice for their families. It is interesting that women are both the most frequent subjects of care and recipients of it. When brands communicate safety from anxiety through care, they usually show women as the consumer. In the second place – children and older people. Men are represented as recipients of care in the family environment, with children, at home. Very rarely are men shown receiving care in other circumstances. Signs of caregiver: confident smiles, important, authoritative position in the shot, hugs and kisses. Signs of care receiver: relaxation, happy smile, images of enjoying (product, service). Serenity and calmness. • Informed Control All the previous codes contained the idea of controlled consumption and personal responsibility. However, there are branding concepts in which this idea becomes central. The code is rational and it is based on informing consumers about possible threats and giving instructions on how to avoid them (or life hacks). The theme also concerns the accessibility of information. Constant access to mobile and internet connection is the necessary attribute of safety today. Knowing the sources of trusted information is the way to feel protected in a world when media are full of lies and propaganda. Consumer online forums, recommending services, independent check-ups of products (RosControl company). Signs: instructions, rules, schemes, long texts, explanations, information about details. In the article we described the most visible dominant codes of Protection in Russian marketing communication. These are often used in combination with each other, providing a complex image of safe and reliable brand. We can see that the prevailing safety and protection themes in Russia tend to be rather patriarchal. Protection usually comes from masculine characters, or products that have masculine elements (the codes “Barrier”, “Tool”, “Hero”, “Science”). However women too can be protective figures (through “Care” or “Nature”) but most of the codes portray women as the recipients of protection. The source of protection can be in the future or in the past. References to the past are more often used in brand communication in Russia. It seems that Russian marketers perceive technologies and futuristic dreams as great, but as the future is uncertain, they choose the symbols of past achievements and local traditions. The analysis shown that there are many possible ways for a brand to communicate the meaning of safety, both direct and connotative, and thus help reduce anxiety in Russian society. The revolution of 1905; World War I; the Revolution of 1917 and the establishment of USSR; Civil War, hunger of 20-s; Stalin’s repressions of 1930-s; World War II, during which USSR lost from 20 to 40 million citizens (by different estimates). Pavlov’s money reform of 1960-s, war in Afghanistan in 1980-s. Gorbachev’s Perestroika, leading to the breakdown of USSR in 1991. Economic collapse of the 1990-s.
You are currently browsing the Semionaut blog archives for July, 2017.